Due to the absence of official house price statistics, it is hard to assess the exact movements of house prices in Costa Rica, but the trend is clearly downwards. In San Jose, the country's capital, the average listing price of houses fell by 2.2% y-o-y to US$1,142 per square meter (sq. m.) in November 2017, according to encuentra24.com. On the other hand, condominium prices in San Jose dropped slightly by 0.8% from a year earlier, at an average of US$1,716 per sq. m. over the same period. Almost all other provinces in Costa Rica also registered falling residential property prices during the year to November 2017. In Guanacaste, house prices plunged by 28.6% y-o-y to an average of US$1,158 per sq. m. while condo prices registered almost similar decline to an average of US$1,038 per sq. m.
In Alajuela, the average listing price of houses remain unchanged at US$974 per sq. m. in November 2017 from a year earlier while condominium prices fell by 6.2% to an average of US$1,007 per sq. m.
In Cartago, the average listing price of houses dropped 1.4% y-o-y to US$995 per sq. m. while condo prices fell by 11.9% y-o-y to US$1,150 per sq. m.
In Heredia, house prices increased slightly by 0.2% y-o-y to US$1,001 per sq. m. while condo prices fell by 4% to an average of US$1,356 per sq. m.
In Puntarenas, house prices fell by 22.7% y-o-y to US$1,270 per sq. m. while condo prices dropped 17.5% y-o-y to US$1,586 per sq. m.
In Limon, house prices rose strongly by 39.4% y-o-y to an average of US$888 per sq. m.
However property transactions have risen by double-digit figures since 2013, according to local real estate experts. Tourism, too, remains vibrant, with the total number of tourist arrivals increasing by 12.8% y-o-y to a record 2,925,128 people in 2016, according to the Costa Rican Tourism Board. So, what might have caused the decline in residential property prices? This is mainly because of a supply glut caused by continued increase in residential construction, particularly condominium projects, over the past few years. In 2016, the number of residential building permits in Costa Rica rose by 6.6% to 24,188 units from a year earlier, with San José registering a huge 26.5% y-o-y rise, according to the Instituto Nacional de Estadística y Censos de Costa Rica (INEC). A few years back, ERP Lawyers & Associates (ERP) already issued warnings about the development of a large number of apartment buildings and vertical housing projects in Costa Rica, particularly in the Greater Metropolitan Area (GAM). "A clear example of this situation is that today, for every kilometer traveled, we'll probably bump at least into one construction," said Eduardo Rojas, founding partner of ERP Lawyers & Associates (ERP). "The high prices are a problem that blocks the market. The kind of developments that have been implemented (from $120,000 up) are looking towards the middle-high class, because the middle-lower class cannot bear such a financial responsibility," added Rojas. Residential property prices in Costa Rica are expected to continue falling next year, or remain stable at best, until most of the excess supply is being absorbed in the market. However interest from foreign investors is projected continue to rise. Costa Rica's economy is expected to expand by 3.8% this year, after 4.3% growth in 2016, 4.7% in 2015, 3.7% in 2014, 2.3% in 2013, 4.8% in 2012, 4.3% in 2011, and 5% in 2010, according to the International Monetary Fund (IMF). 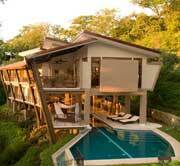 There are no restrictions on foreign buyers in Costa Rica. There are good rental returns to be had in Costa Rica. San Jose houses generate on average 8.6% returns - surprisingly good! Apartments and houses in San Jose Province, in San Jose city, Escazu and Santa Ana generate around 7.5% returns. There only appear to be minor differences in rates of return between houses and apartments. Much the same applies in Heredia province, and in Alajuela. These returns are slightly below what one would have expected 5 or 10 years ago, but not much less. Our research concentrates on the market's higher end. Rental returns are likely to be higher on smaller properties in less desirable areas. Rental Income: Rental income is taxed at progressive rates, from 10% to 25%. For tax year 2017-2018, the first 3,549,000 (US$6,338) income is not taxed. Capital Gains: If capital gains are not derived from habitual transactions, they are tax exempt. Otherwise, capital gains are taxed at a flat rate of 30%. Inheritance: Transfer of Costa Rican properties, even by way of inheritance, is taxed at progressive rates, from 1% to 2%. Residents: Residents pay tax on their worldwide income at progressive rates. Income from non-employment sources are taxed separately from employment income. Total roundtrip transaction costs are around 8.75% to 14.75%, inclusive of the real estate agent's fee that ranges from 5% to 10%. It is customary for the buyer and the seller to share the costs equally. The buyer must be wary of buying a property with liens or squatters. Despite the passage of a new law aiming to strike a balance between landlords and tenants, the rental market is still pro-tenant. Rent: Rents can initially be freely negotiated between landlord and tenant. If rent for housing purposes is agreed in US dollars or other foreign currency, no yearly increases are allowed. Rent increases are allowed only in the case of agreements in colones, the Costa Rican currency. Tenant Security: The minimum lease term is three years, but the tenant can cancel it anytime by giving a three-month notice. Unpaid rent can be very difficult to collect. Costa Rica, with a total population of almost 5 million and GDP per capita of US$11,857 in 2017, has long been a popular tourist destination. Beautiful beaches and valleys, tropical greenery, wide biodiversity and a comfortable climate attract a growing number of tourists. Costa Rica’s economy is expected to expand by 3.8% this year, after 4.3% growth in 2016, 4.7% in 2015, 3.7% in 2014, 2.3% in 2013, 4.8% in 2012, 4.3% in 2011, and 5% in 2010, according to the International Monetary Fund (IMF). Costa Rica had robust economic growth from 2003 to 2007, with annual average real growth of 5.6%, according to the IMF. However, the economic growth slowed to 4.7% in 2008 and contracted by 1% in 2009, due to the global crisis. Despite healthy growth and manageable inflation, Costa Rica continues to face liquidity problems. The fiscal deficit stood at 5.2% of GDP in 2016, down from 6.4% in the previous year. However the deficit is expected to rise again to about 6.1% of GDP this year, according to the Banco Central de Costa Rica. As of October 2017, fiscal deficit has reached 4.6% of GDP, above the 3.9% registered in the same period last year, according to the Ministry of Finance. Costa Rica “faces liquidity problems in paying its obligations and guaranteeing the provision of services,” said President Luis Guillermo Solis. “Despite all the public calls and efforts we have made since the start of my administration to contain spending and increase revenues, there is still a gap that we must close with fresh resources,” Solis added. Both Standard & Poor’s and Moody’s Investors Service affirmed their negative outlook on Costa Rica in February 2017. In addition, also downgraded the country’s government bond rating to Ba2 from Ba1. In 2015, all three leading credit rating agencies had cut Costa Rica’s credit rating to junk status, citing the country’s weakening public finances. “The key driver behind the downgrade to Ba2 is the continued weakening of Costa Rica’s fiscal profile, reflected in its rising government debt burden and persistently high fiscal deficit,” said Moody’s. The country’s consolidated public debt was equivalent to 49.2% of GDP in 2016, up from 45.4% in 2015, 42.8% in 2014, 41.8% in 2013 and 24.2% in 2008. Total debt is projected to increase further to 51.9% of GDP this year and 54.1% next year, according to the IMF. The current account deficit fell to 3.2% of GDP in 2016, from 4.3% in 2015 and 4.9% in 2014, according to the IMF. However, it is expected to rise again to 4% of GDP this year. During the third quarter of 2017, unemployment stood at 9.4%, up from 8.5% in the previous quarter but down from 9.7% in the same period last year, according to INEC. Consumer prices in Costa Rica increased 2.33% y-o-y in October 2017, up from 1.64% in the previous month and 0.55% in a year earlier. In January 2015, the BCCR adopted a managed float exchange rate regime, with a range of 500 to 800 colones per USD1, and vowed to intervene only when the currency shows excessive fluctuations. In September 2017, the average monthly exchange rate stood at US$1 = 575.83 colones.